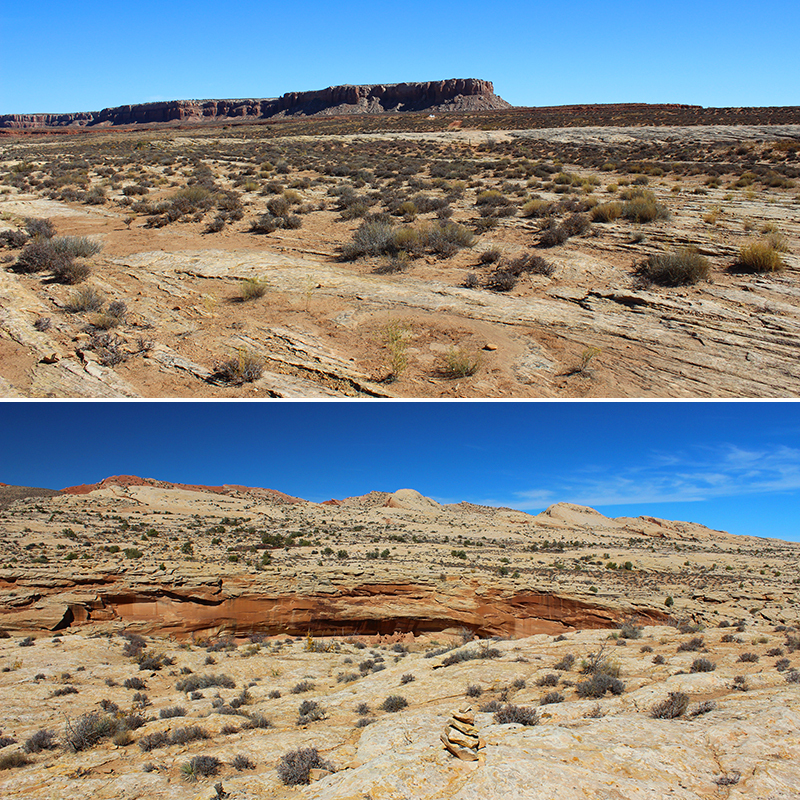 Southeastern corner of Utah … When we told people about our plans to visit Bluff Utah and surrounding areas, we heard remarks like, “Oh! 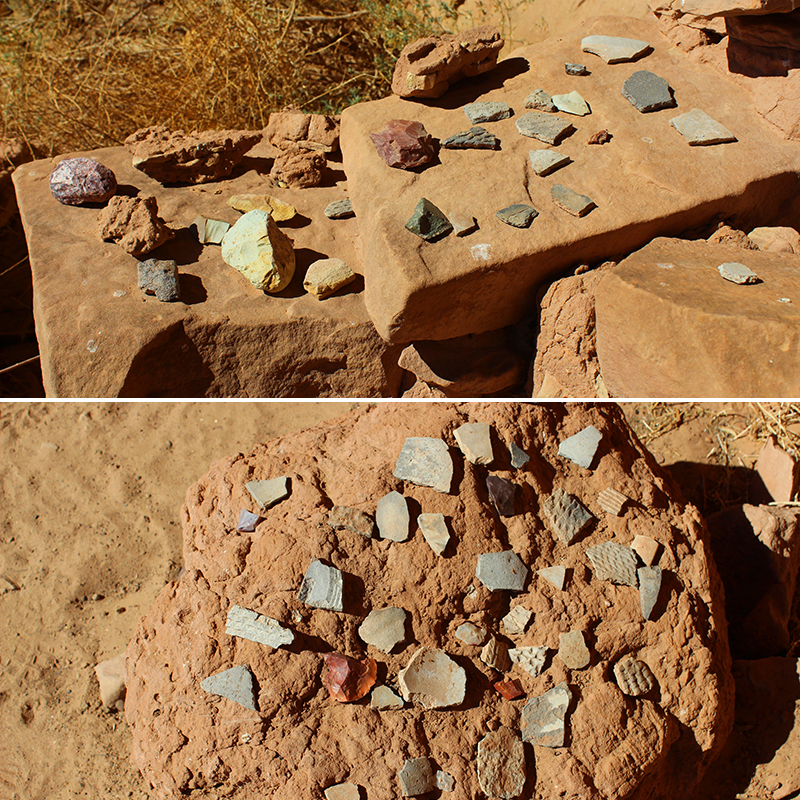 Valley of the Gods,” and “Be sure you make it to Monument Valley,” “That is seriously out in the middle of nowhere,” “The Forest Gump Road is out there,” and “Check out the hikes and rock art.” Great advice, indeed. 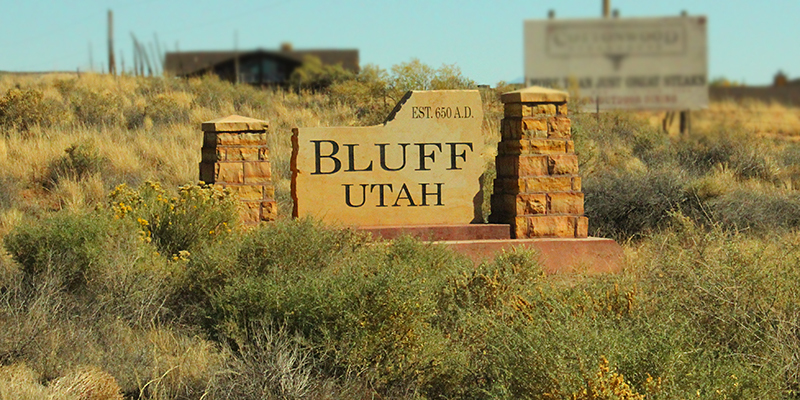 Bluff is a cute little town with a population of about 350 in the summer and 150 in the winter. 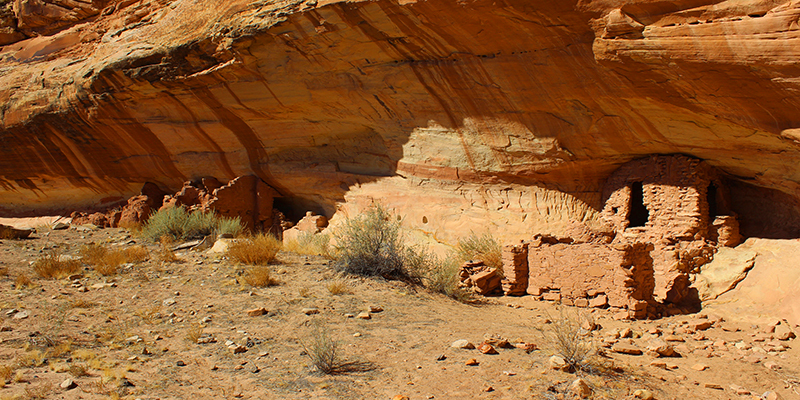 The town was founded in 1880 but the Ancestral Puebloans inhabited the area as far back as 650 A.D., as their sign indicates (see below). 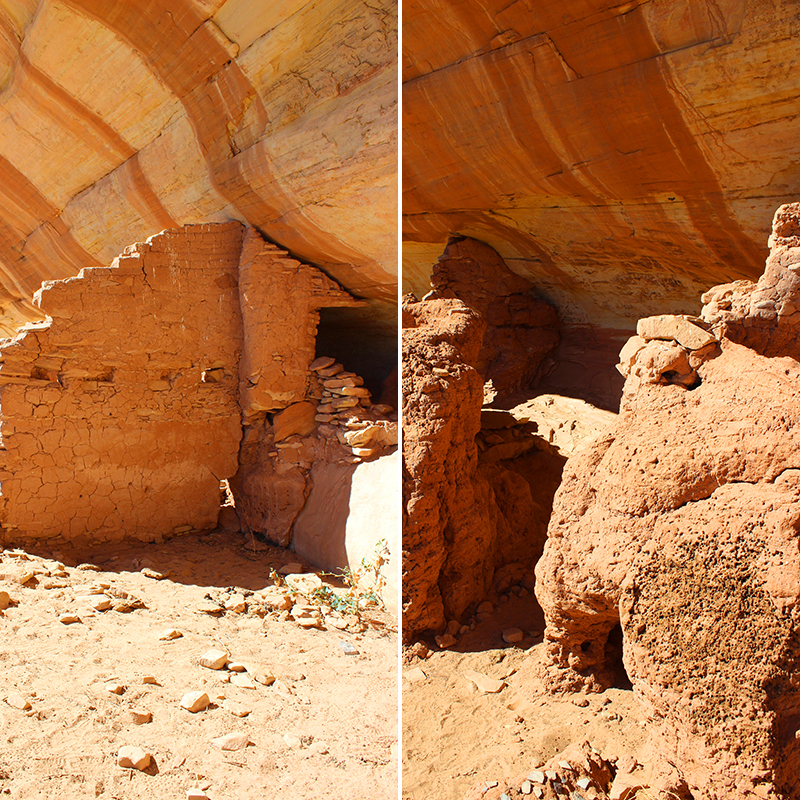 In the next few weeks we will be sharing some of our discoveries from this part of the Southwest, breathtaking red rock landscapes and exquisite, rugged beauty — most of which is protected by the Bears Ears National Monument. 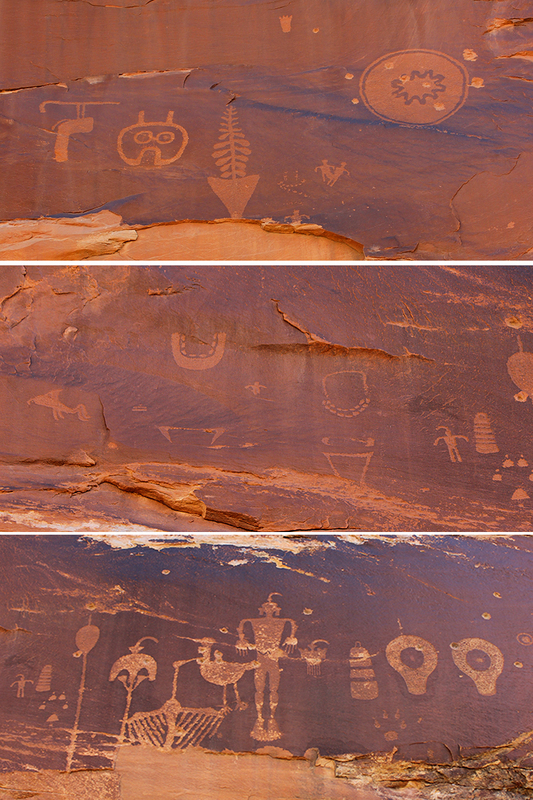 Today we’d like to take you on a unique hike to find the Wolfman Petroglyph … another ‘outdoor museum’ experience. Mid-October and the temperatures were in the mid-70’s to 80s in the day, dropping to the low 40s at night. 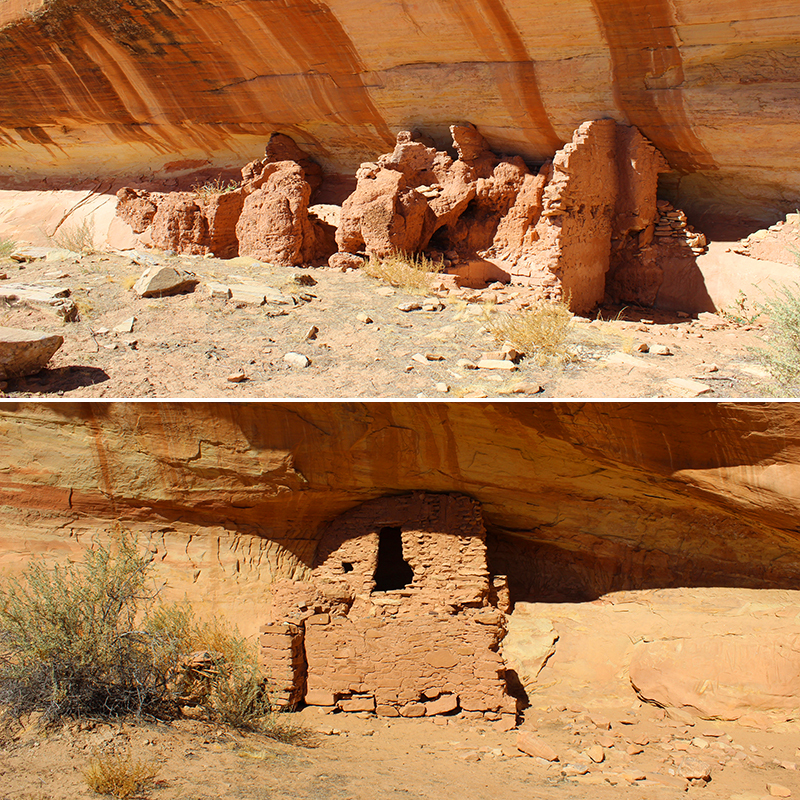 Perfect weather for setting out to see an impressive set of petroglyphs and ruins, fondly named “The Wolfman Petroglyph Panel,” and the “Small Ruins” nearby. 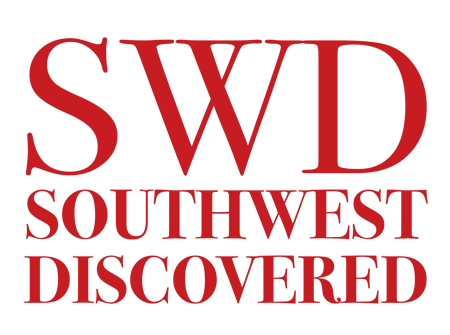 Located down a side road off the Butler Wash Road 262, about 5.1 miles west of Bluff on Highway 163. 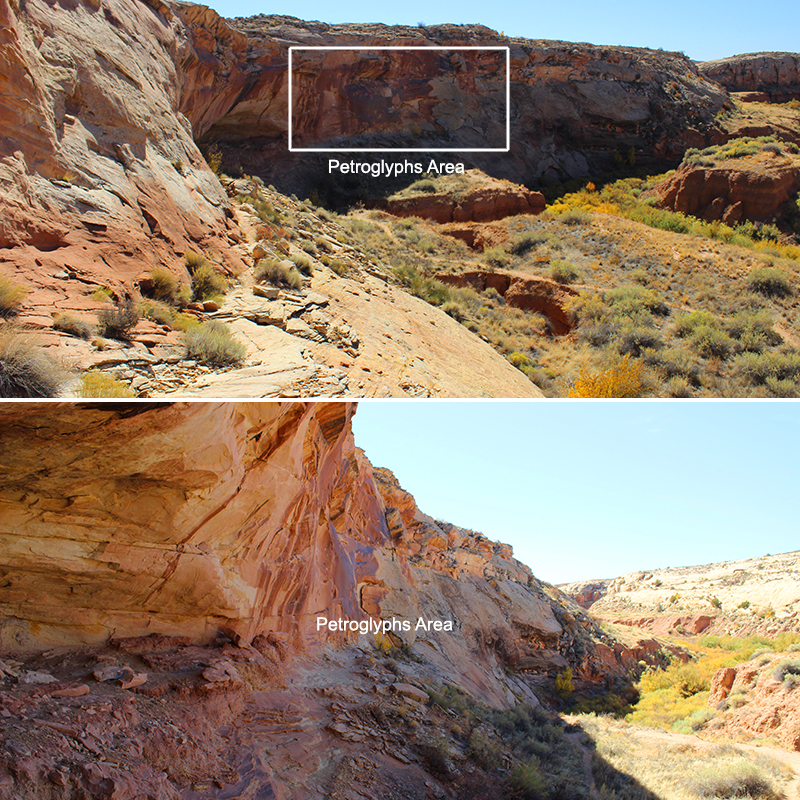 The panel, as well as many other fascinating archeological sites, is part of the striking Combs Ridge geological formation. 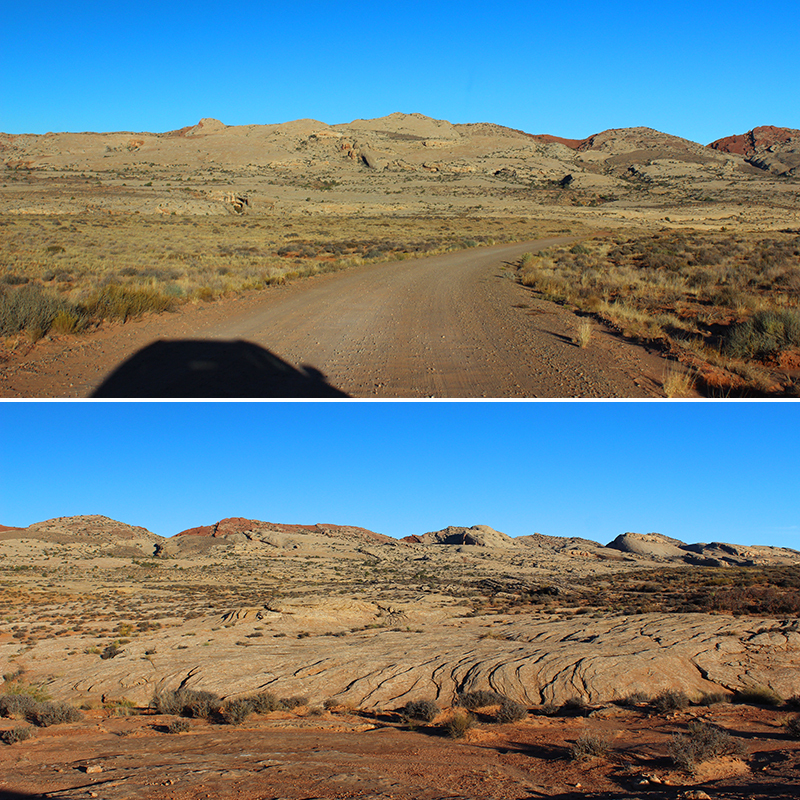 It’s recommended that you have a high clearance vehicle to get there, as the dirt road can be rather bumpy with washboard ruts, rocks, and soft sand. 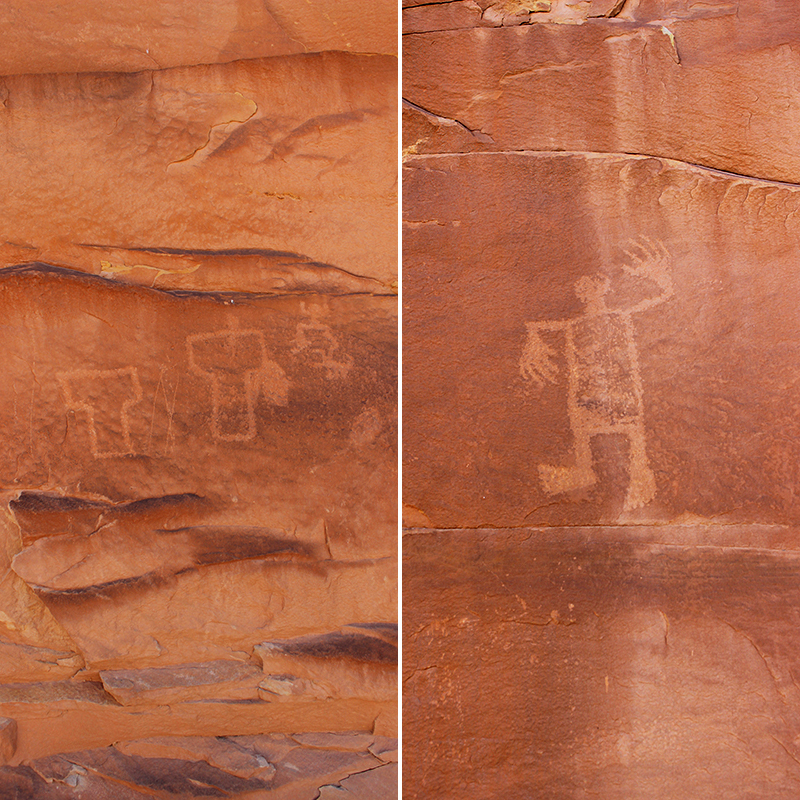 But since the Wolfman Petroglyph is roughly 1 mile from the main Highway, a regular auto should make it just fine. Just go slow, take your time, and watch for patches of sand where you might get stuck. 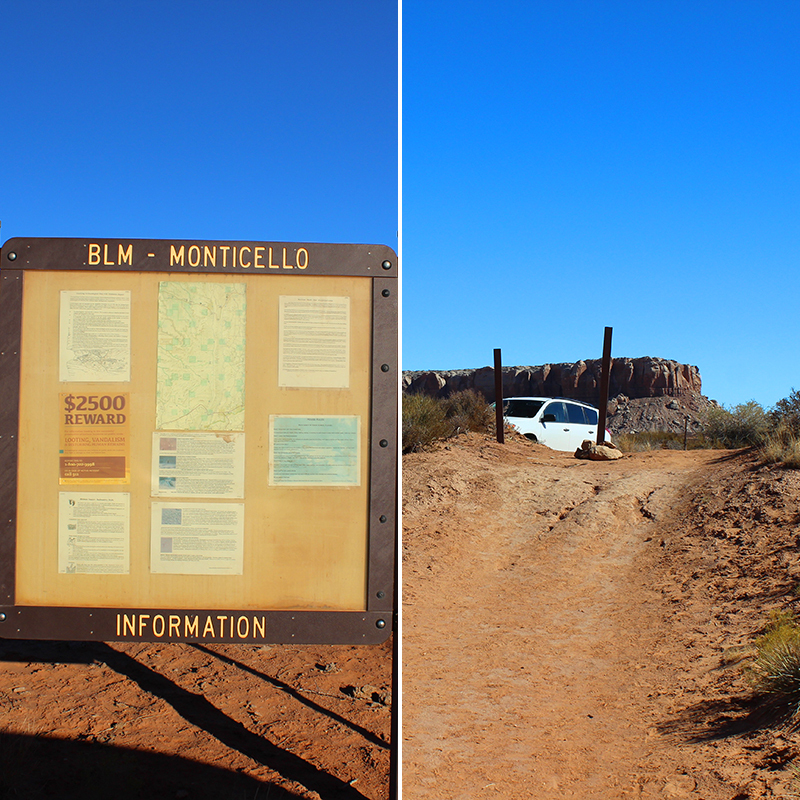 After a few twists and turns of the road, you will arrive at a fence on your left, a cattle guard grate in the road, and a BLM information kiosk. But before crossing the cattle guard, you will want to turn left and follow the dirt road along the fence to a parking area. This is the trailhead. 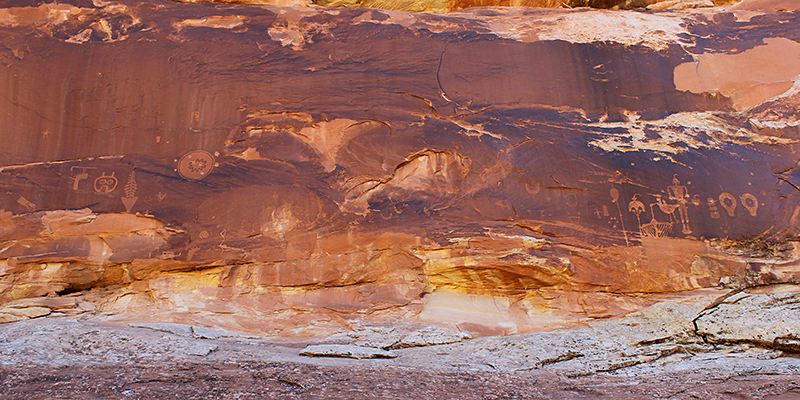 Of the many sites along Butler Wash, the Wolfman Panel is one of the shorter hikes and is relatively easy to access. 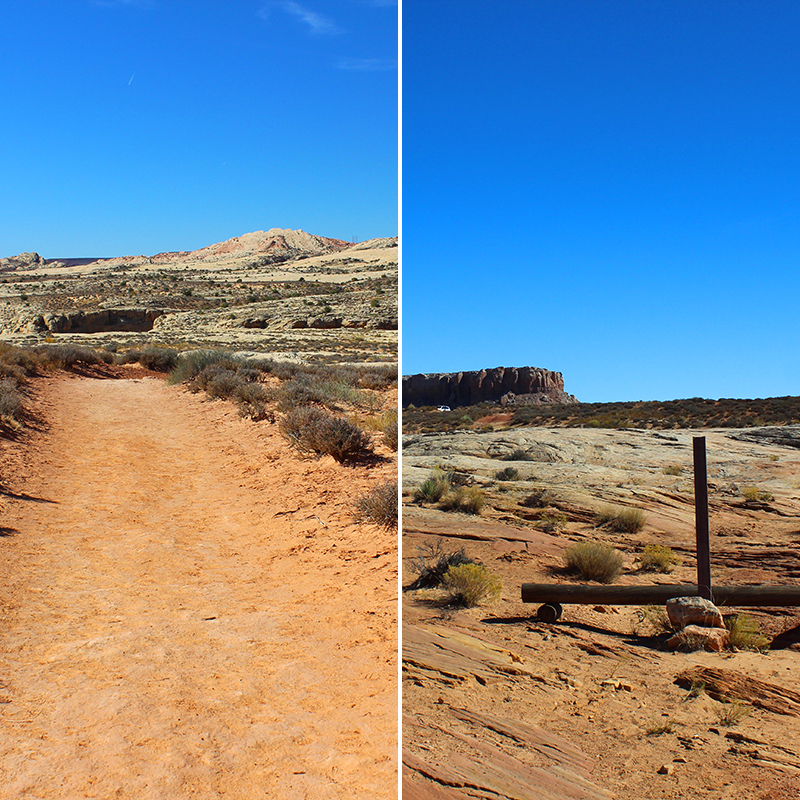 The trail begins at a dirt path west of the parking area, and there are 3 brown trail markers pointing the way. From reading online it’s about a 1/2 mile hike round-trip to the panel, and if you want to continue on, its about 1.4 miles round trip to the Small Ruins from the trailhead. A moderately strenuous hike, be sure you have good sturdy hiking shoes, plenty of water and it’s a good idea to have a hiking buddy. 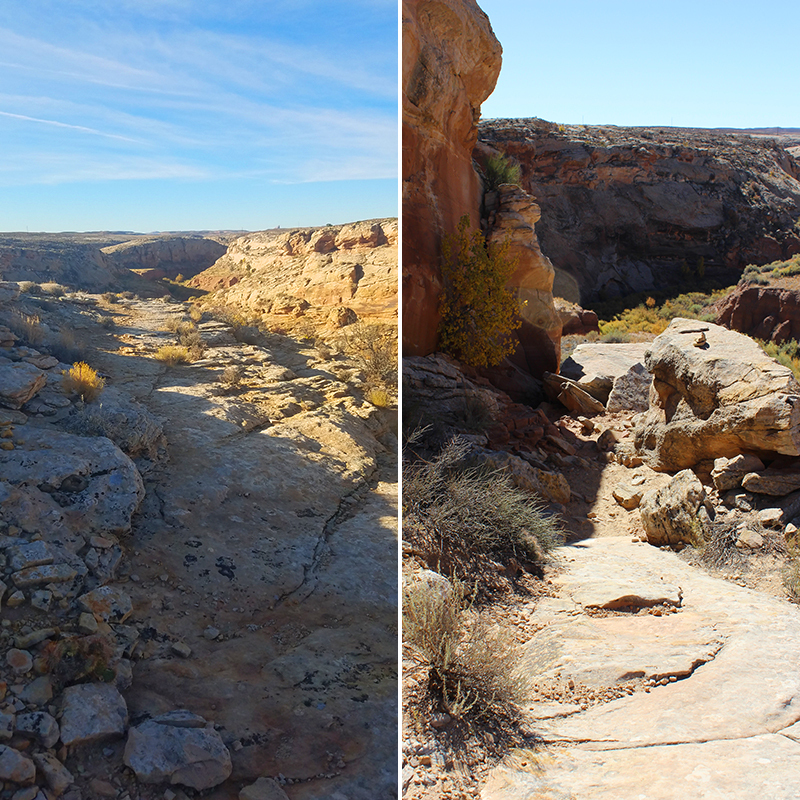 You walk through sand, trek across slick rock, squeeze between boulders, walk along rock strewn ledges, and as you near the panel the pathway becomes more narrow and is on about a 45 degree angle. Take your time and watch your step — because it is absolutely worth it. 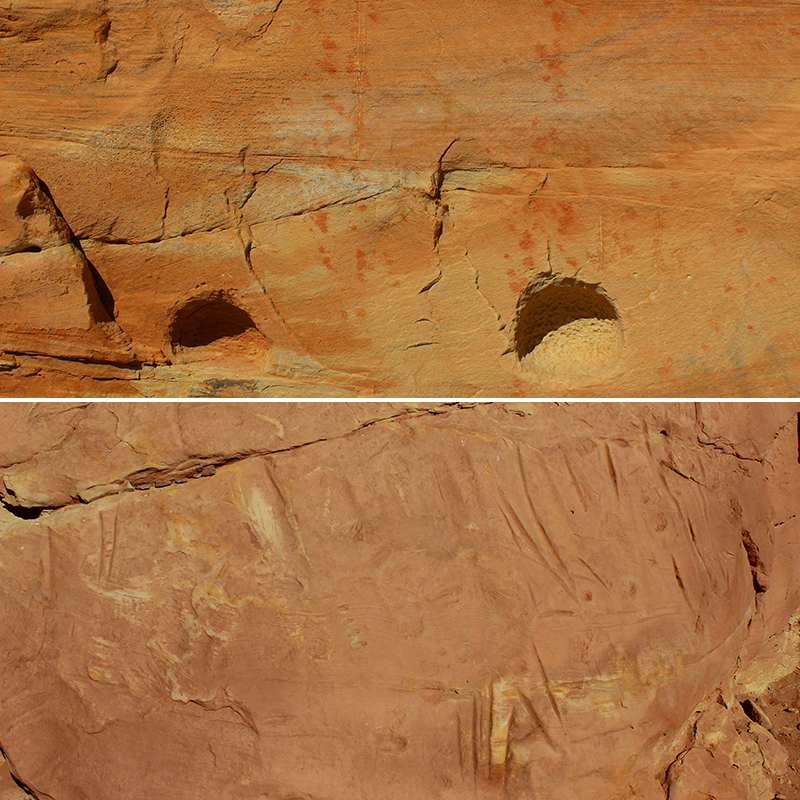 After scrambling down the path, you pass a small alcove and in a few steps you see the first petroglyphs. We’re not sure what they are called but we refer to them as the T-people. Or the T-windows, as many ruins have these T-shaped openings. A few steps more you find the Wolfman with his enormous claw-like hands and big shaggy feet. 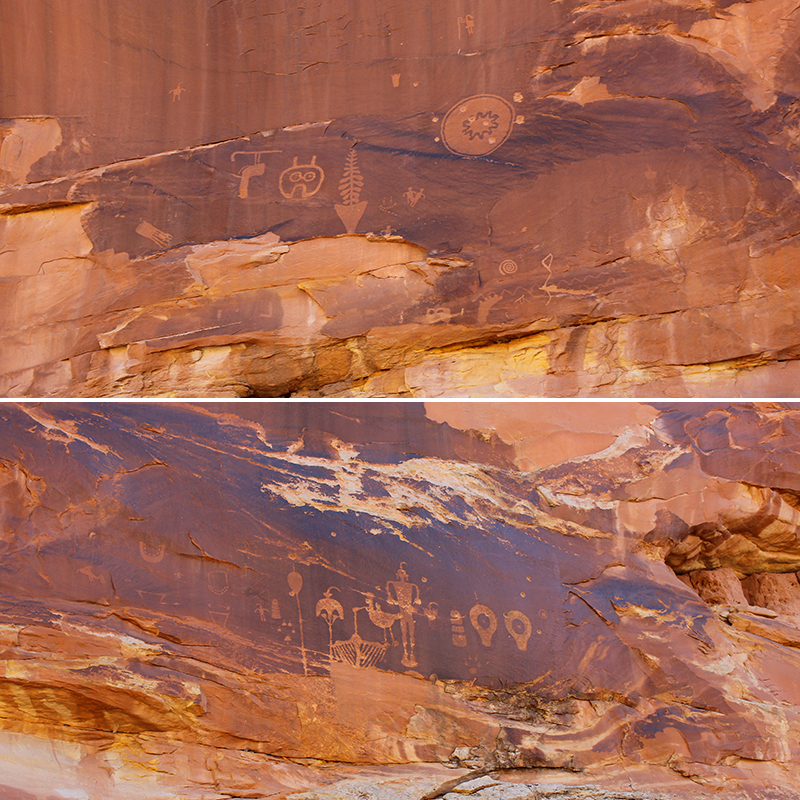 These petroglyphs are on a lighter shade of sandstone, so while the images are pale they are quite visible. They are also fragile, and we were told to never touch them because the oils from our fingertips will darken and ruin them over time. Not far along the path are two impressive panels where the artists carefully pecked out images with amazing detail. These stand out because of the dark desert varnish background. The path becomes narrow, so watch your step as you view them. After studying them up-close, scoot your way down to where the landscape levels out to get a better view of the entire expanse of the panels. It’s fascinating to look at these figures and shapes and wonder what they might mean. What was being communicated? Are they part of story telling, or symbols for spiritual practices? Also, note on the above image that there is a paw print shaped symbol on the right side, below and slightly to the left of the two “light bulbs.” This may also be another reason why this is called the Wolfman Panel. 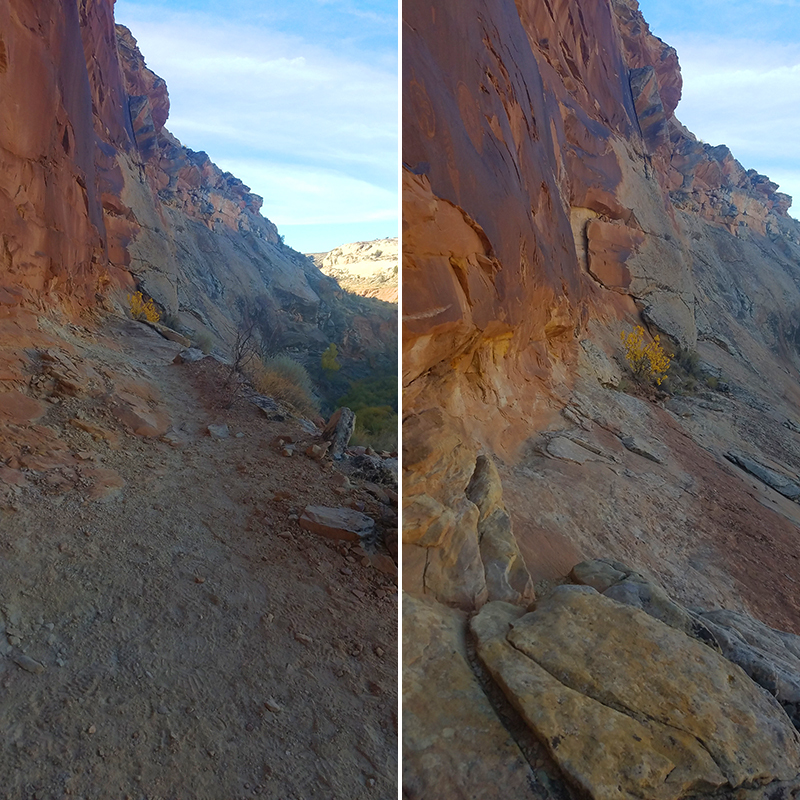 After taking tons of photos, you can either retrace your steps back to the parking lot. Yep, what goes down must come up. 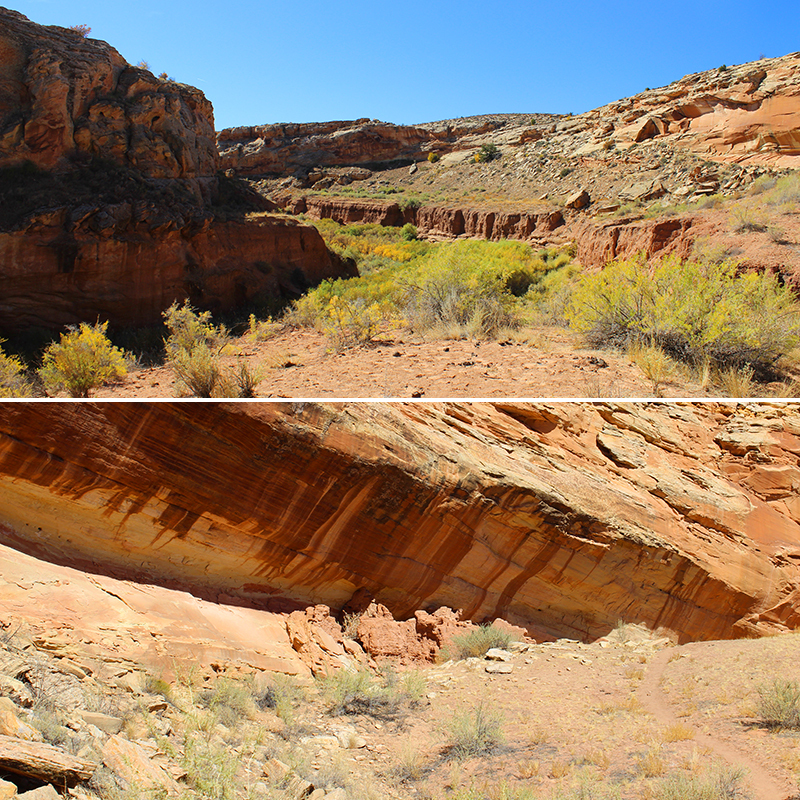 Or, if you are still feeling adventurous, there is a trail below the petroglyphs that heads north to where the Small Ruins are located. 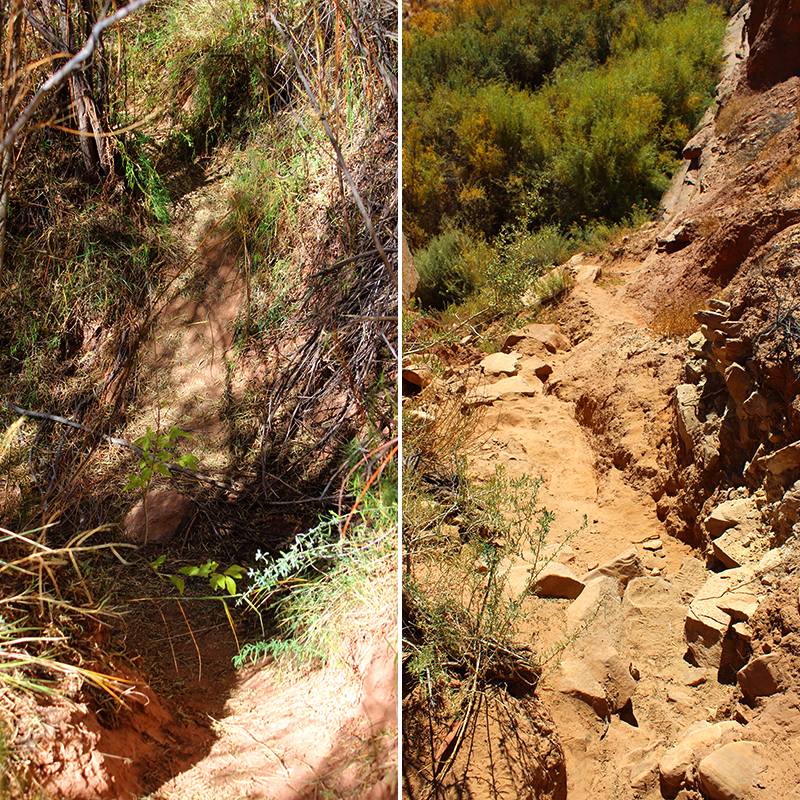 You walk through sand, over rocks, and through the Butler Wash filled with thick willows, shrubs, and reeds. Then scramble up a hill and follow the path to the ruins. The Small Ruins are spectacular. 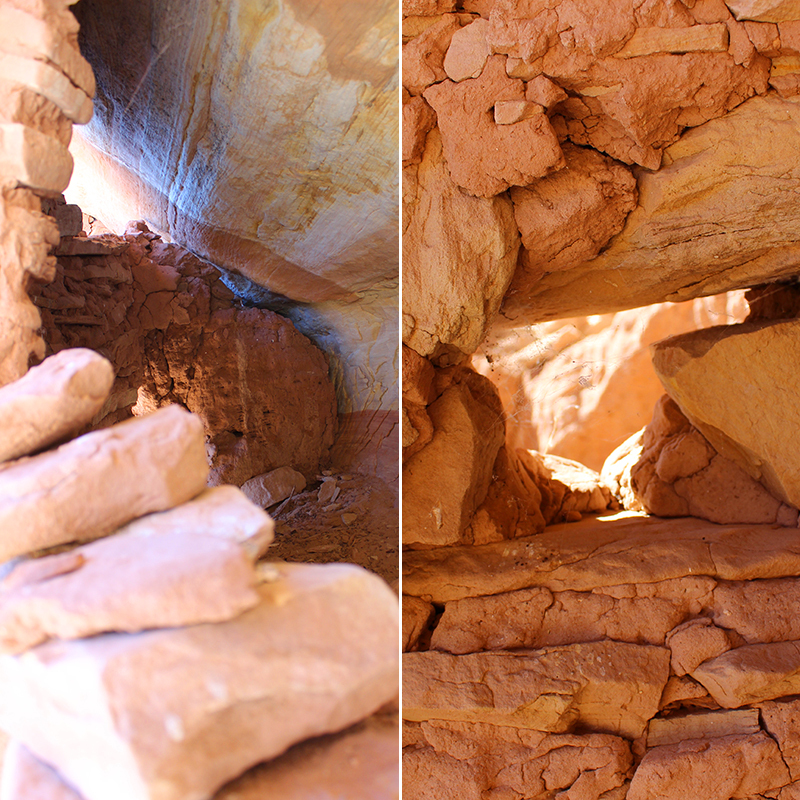 One part is mainly made of mud clay that is crumbling. The other grouping with stone and mud structure is more sturdy. 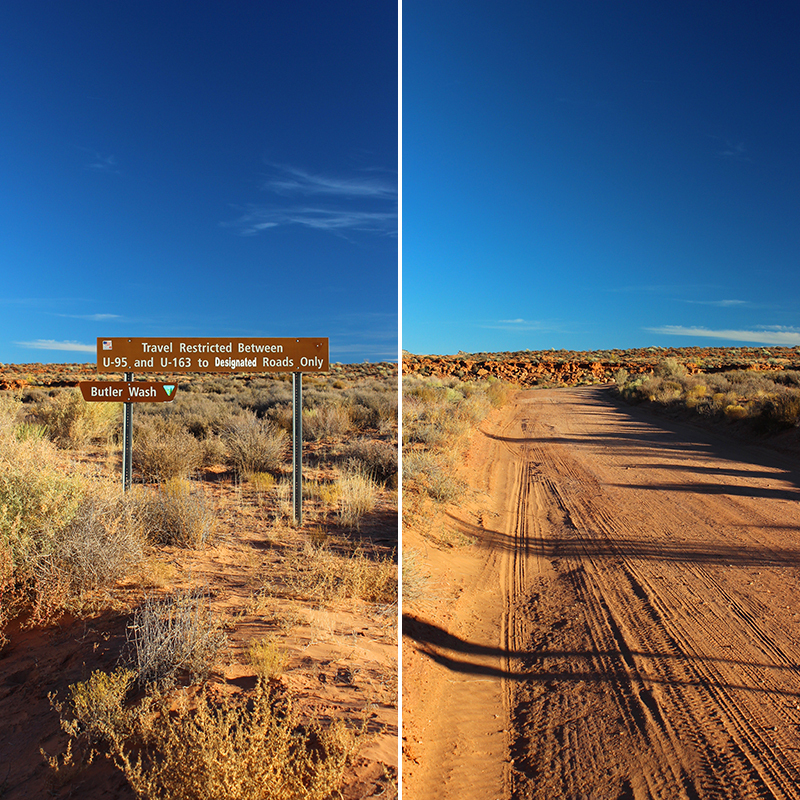 This tiny town of Bluff is surrounded by stunning finds and some of the most iconic landscapes in the Southwest. 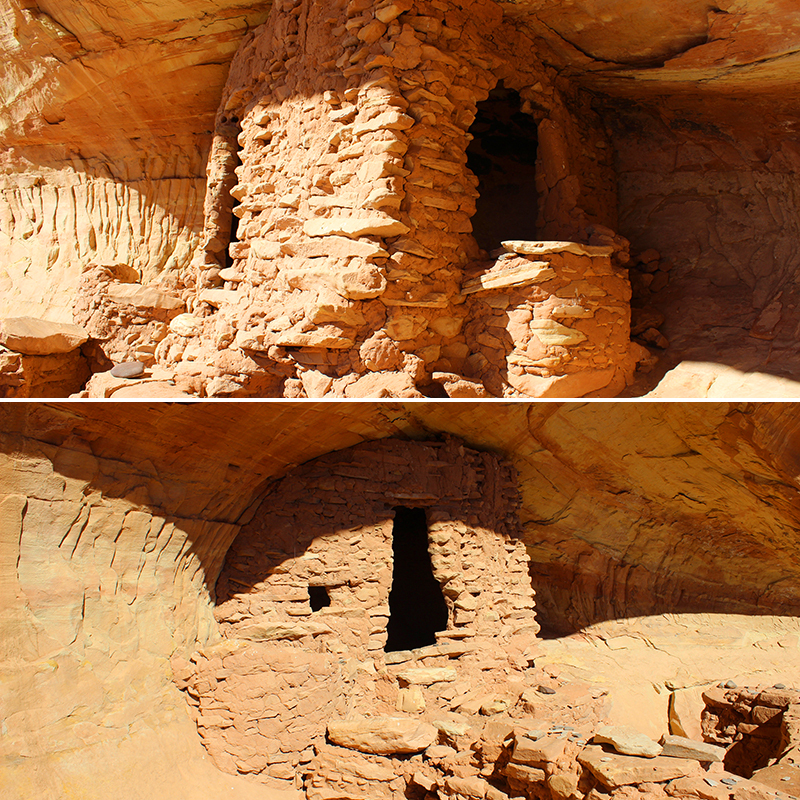 In upcoming articles we will take you through the 16 mile drive through Valley of the Gods, the Forest Gump Road to Monument Valley at sunset, and more landmarks that make this part of Southeastern Utah so unbelievably unique and most of which is protected by the Bears Ears National Monument. 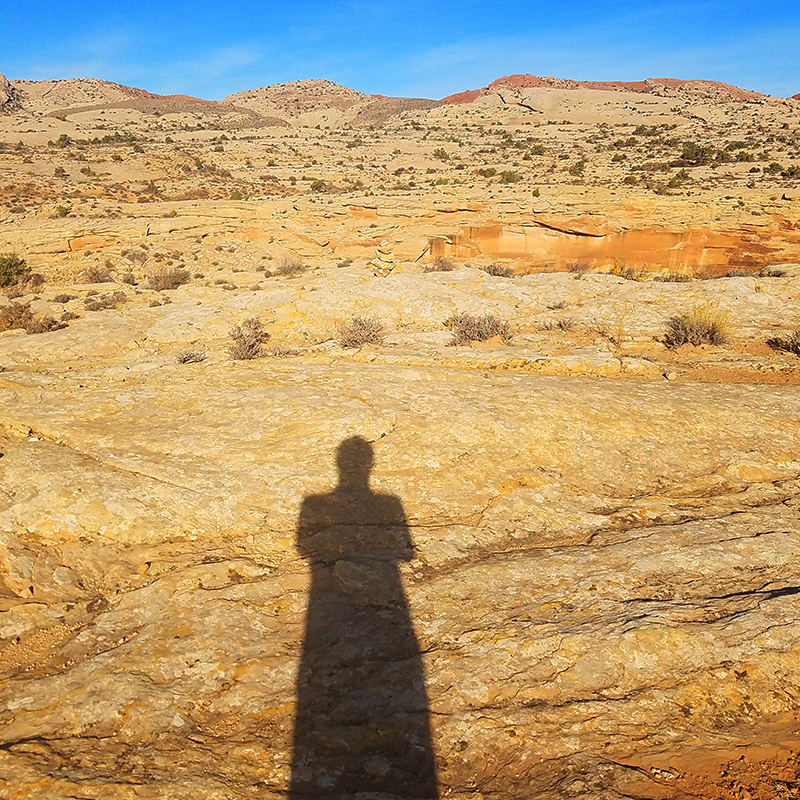 LODGING: We recommend lodging at Desert Rose Inn and Cabins or Valley of the Gods B&B, and if you are on a strict budget and don’t plan on spending much time in your room then the Kokopelli Inn is very affordable and clean. DINING: We had a great dining experience for outdoor grilled steaks, seafood kebabs and pie at the Cottonwood Steak House. Breakfast at Twin Rocks Cafe is down-home no frills deelish. For sandwiches, salads and more pie we liked the Comb Ridge Bistro. We’ve also heard that Duke’s Bistro (a dry establishment) at the Desert Rose Inn has a fine menu. Also, if you like wine and spirits, the closest liquor store is a 2 hour drive in any direction from Bluff, and the closest thing we found to a grocery store was the K&C convenience store in the gas station. If we are leaving out any good tips, please leave them in the comments below. Thanks! I feel as if I have hiked this trail even though medical problems keep me from actually doing it. Thank you. Your photos are always fabulous. Jane, we are so happy to have your company on the hike! Thank you for the lovely comment. Man! 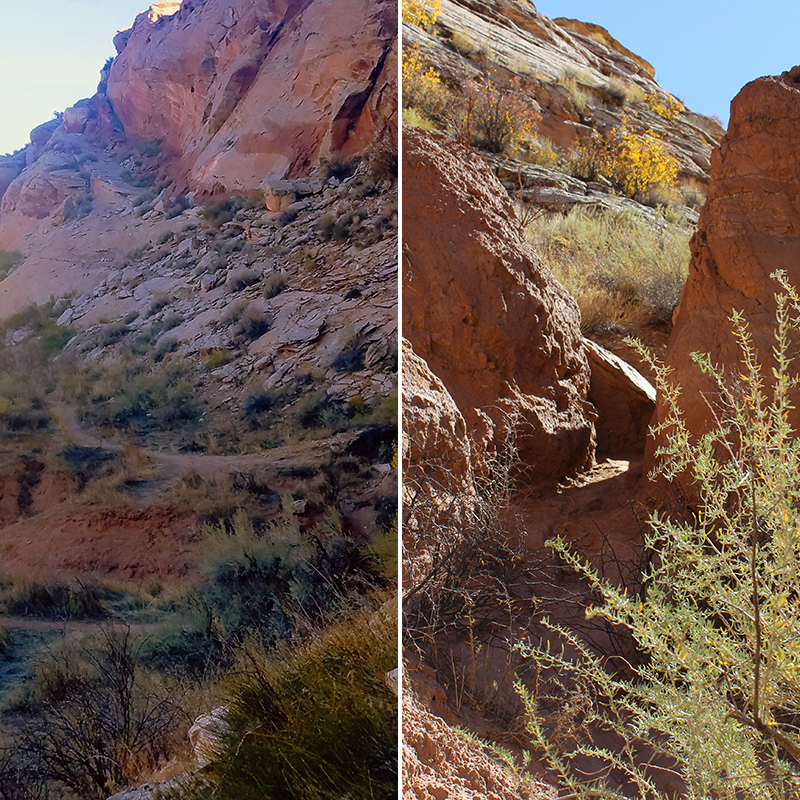 These hikes are awesome! Toad, yes they are and we hope you have a chance to check them out! Ms.M, so happy to hear you are ‘traveling’ with us. Thank you for the kind comment! 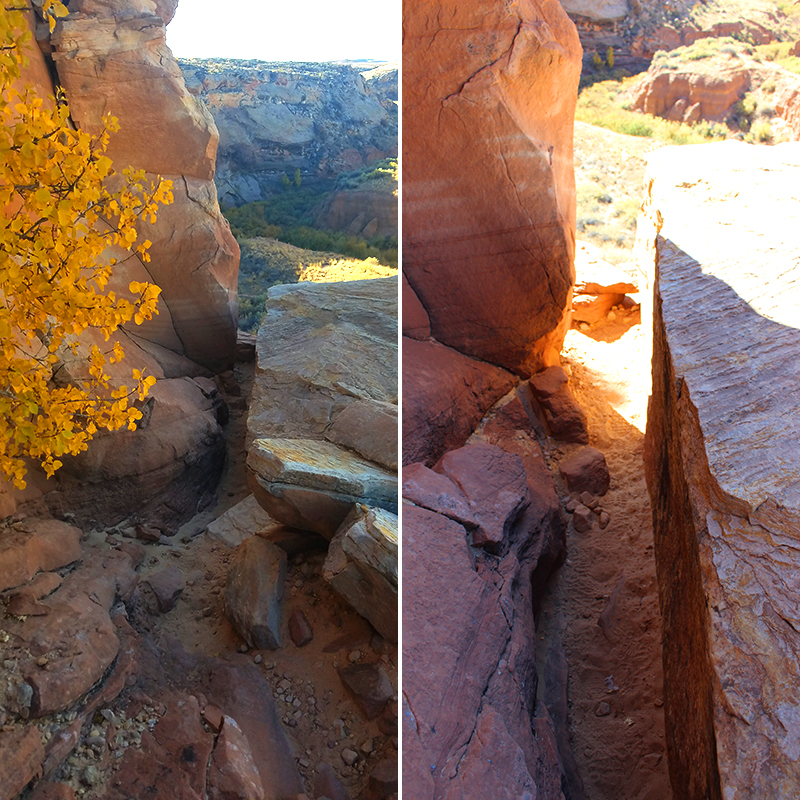 This area of Bears Ears and Canyonlands has some of the best hiking in the world. Wolfman is definitely on the list now. Jeff, when you go be sure to send pics and we’ll share them with everyone. This is amazing. Many thanks for the tip on finding the panel and on where to eat and lodge. Nice! Nadia, amazing is the key word. Amazing these sites and panels are so well preserved. When you go, be sure to check in advance re: lodging and dining, as many places are seasonal. And always check ahead for weather conditions.